More cakey than chewy but definitely soft. Not as cakey as whoopie pie, but similar. 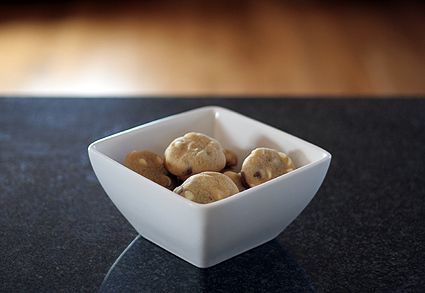 I used milk and white chocolate chips. Preheat oven to 350 degrees Fahrenheit. Whisk together flour, salt, and baking soda. Beat butter and sugars with a mixer on medium-high speed until pale and fluffy, 3 to 5 minutes. Beat in egg and vanilla. Reduce speed to low. Add flour mixture in 2 batches, alternating with sour cream, and beat until just combined. Stir in chocolate chips by hand. Cover, and freeze for 10 minutes. Using a 1 1/2-inch ice cream scoop or a tablespoon, drop dough onto baking sheets lined with parchment, spacing about 2 inches apart. Flatten slightly. 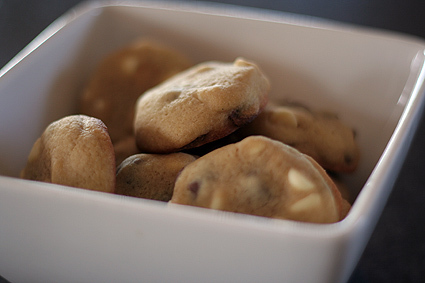 Bake until centers are set and cookies are pale golden brown, 12 to 14 minutes.